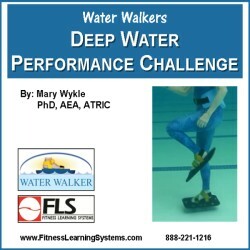 Describe how water walkers can be integrated into deep water exercise. Discuss 4 concepts related to deep water mechanics. Describe how water walkers function as drag resistance. Recognize basic training tips and benefits for using water walkers in an exercise program. Explain how to safely and effectively perform 5 initial exercises and 5 challenge graduated water walker exercises. Discuss recommendations and formats for 2 types of deep water interval training with water walkers.